We would refer you to Elizabeth Wrights Summer Camp, Pacific Blue, School of Rock, GreenBroom. Happy Summer! Camps may be cancelled up to 2 weeks prior if class requirements are not met. 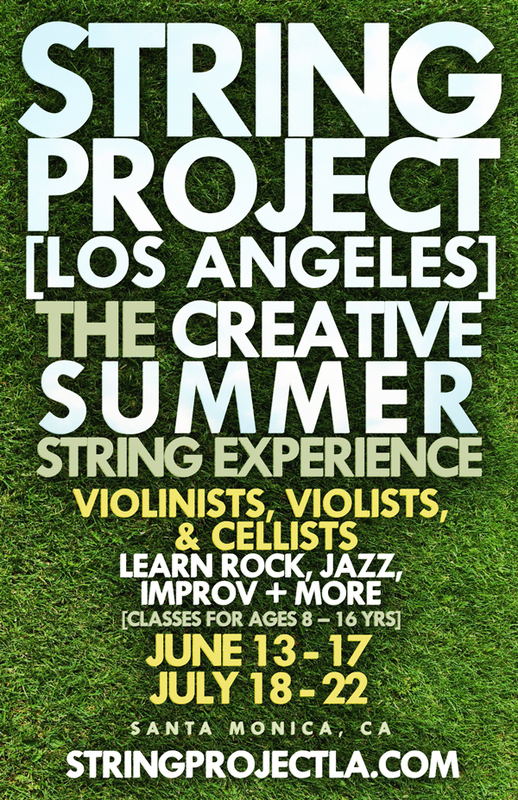 Established in 2006, String Project LA´s Summer Camp Experience offers two separate and unique one-week Day & 1/2 Day camps located in Santa Monica, CA for elementary & middle string players. This unique experience offers daily instruction in a small ensemble setting as well as courses in improvisation, rhythm, theory, music history and master classes with guest artists. The SPLA summer experience gives young classically trained string players a chance to study contemporary styles like Rock, Jazz and The Blues. In these fun fast-paced workshops, students will improve their musical ear, rhythm and ensemble skills through the study of improvisation, groove, music theory and more. These classes are ideal for students with little or no improvisational experience and are a great preview for students looking to join our program during the year. Come join us for an experience unlike any other! Students have the opportunity to work with String Project Los Angeles faculty members; established educators and first-rate professional musicians who focus on many aspects of musicianship and artistry in blues, rock, and jazz string playing. Students will learn all the important skills needed to express themselves creatively on the highest level possible! The Summer Strings Experience Camp is an ideal activity for the young string player who is seeking a glimpse into the world of improvisation and alternative styles. Our mission is to create a fun, fast paced, challenging environment to help students connect with their passion for music. Previous guest instructors and workshops : Movement & Stage Presence Workshop with Christine Georgi & Learning how to write and arrange popular music with Noah Needlman. As one of the most in-demand violin and fiddle teachers in Los Angeles, Lydia Veilleux has been teaching students of all ages for over 10 years. She is a certified O’Connor Method teacher and a member of the American String Teachers Association. Her students have been accepted into the Manhattan Beach Honors Strings Program and the North Torrance Youth Chamber Orchestra, have won first place in the beginning fiddle contest at the Old Time Fiddler’s Convention and The El Segundo High School PTA Reflections Competition, and have placed in the beginning and intermediate fiddle divisions of the Topanaga Banjo Fiddle Contest. Lydia is an advanced division judge at the Topanga Banjo Fiddle Contest and the Cloverdale Fiddle Contest. She has taught at the Parkfield Bluegrass Festival kid’s camp and workshops at Calico Spring Festival, String Project LA and The Old Time Fiddler’s Convention and Festival. Lydia has also taught adult violin classes at Santa Monica College. She will be teaching workshops in 2015 at String Project LA spring break camp, Calico Spring Festival, Topanga Banjo Fiddle Contest & Folk Festival, and Summergrass Bluegrass Festival. Lydia has a B.M. in Violin Performance from Berklee College of Music, where she studied fiddle with Matt Glaser and classical violin with Sandra Kott. She also studied classical violin with Marylou Churchill while in the Contemporary Improvisation Masters program at New England Conservatory. Lydia teaches beginner through advanced private violin and fiddle lessons in the Los Angeles South Bay for ages 6 through adult. For your convenience Lydia will travel to your home in Hermosa Beach, Redondo Beach, Manhattan Beach, El Segundo, or Hawthorne. Lessons are held at the same time each week, with flexible options for scheduling make-ups due to illness or scheduling conflicts. Lessons are billed monthly at the beginning of the month. Rates for lessons are: $40 per 1/2 hour, $60 per 45 minutes or $80 per hour. Lydia is currently accepting new students. Please contact her at (617) 771-6359 or lydiaveilleux@gmail.com if you are interested in lessons. Another exciting addition to the Summer Camp is the return of Christiane Georgi! Christiane is originally from Switzerland. There, she made her stage debut as a dancer at the age of 3. She trained and performed as a dancer up until her early 20’s, professionally touring in Switzerland. She started acting during an exchange that brought her to Santa-Monica College where she majored in Dance and Theatre. She went on to master many of the renowned acting techniques: Stanislavsky, Meisner, Commedia dell Arte, Michael Chekhov, Clown and Pantomime. She is now a member of The Actors’ Gang as an actress, an assisting director, a teacher and as the new director of the Education Program. Christiane is also the Associate Artistic Director and acting teacher of the Possibility Project, a non-profit organization that empowers foster care teenagers through the performing arts to create. In the last two years, Christiane was invited to direct operas in Switzerland. Credits include: Offenbach’s The Tales of Hoffman and Puccini’s Tosca. She is very excited to bring her knowledge to SPLA. Let’s play some music with all our senses! Learning how to Write and Arrange Popular Music with Noah Needleman. At this years Creative Strings Summer Camp instructor Noah Needleman will be focusing on the form and structure of popular music. Noah will teach the summer students about the building blocks of the songs we grew up listening to, culminating in the collective writing and arranging of popular style songs. Violinists, Violist, Cellist can now learn how to not just play music, but MAKE music! Be sure to Sign Up here to secure your spot or for an Audition before March 30th!